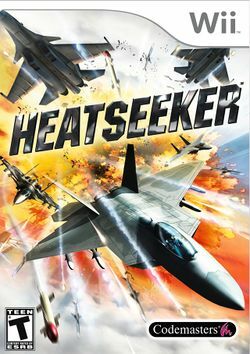 Heatseeker is a jet fighter game for the Wii, PlayStation 2, and PlayStation Portable game systems jointly developed by IR Gurus (now Transmission Games) and Codemasters. The PS2 and Wii versions of the game were released on March 30, 2007 in both Europe and Australia, and on May 1, 2007 in the US. The PSP version was released on May 8, 2007 in the US, May 25, 2007 in Europe, and on June 1, 2007 in Australia. Heatseeker is an aerial combat game that pits players against a variety of computer-controlled airborne opponents. Players are equipped with modern military hardware and a choice of weapons, and missions take place over Korea, the Caribbean and Antarctica. Players take on the role of an International Council pilot Mike "Downtown" Hudson, often accompanied by wingman Hank "Divot" Harrison. The game begins with a terrorist attack. The plot follows the International Council's attempt to thwart a dangerous dictator with an advanced nuclear cache named Bae Jung-Tae. Along the way, the player uses their flying and fighting skills to tackle a range enemies in the air, on land and at sea. This page was last edited on 24 February 2010, at 20:24. This page has been accessed 9,860 times.